Ty: Labor Day has passed, so some beaches that are closed to pets during the busy summer months may now be dog friendly again. Order is restored! Ty: While I don’t want you to think I’m concerned for your welfare, Buster, today we’re sharing some tips to help keep all dogs safe on the beach. Buster: I know you love me. You don’t have to say it. 1. Not all dogs can swim. That’s right, the doggie paddle does not come naturally to every dog … like Ty for example. In fact, certain breeds like Corgis and Pugs don’t swim at all. Find some quiet water and give your dog a chance to show you if he can swim or not by encouraging him to follow you. Never throw your dog in the water and expect him to swim. 2. Drinking salt water is a bad idea. This is logical, and yet getting Buster continues to try to lap up the ocean. Pack plenty of fresh water to keep you both hydrated. 3. Invest in a life vest. Waves, current, and rip tides can quickly exhaust your dog, and that can be deadly. Life vests made specially for dogs come in all sizes. When you’re making your selection, look for one that fastens at three points and has a handle on the back, making it easy for you to lift or pull your dog out of the water. 4. Use sun screen. You’re not the only one that needs to be concerned with sunburn. Get a sun screen specially formulated for dogs and apply it to your dog’s nose and ears 30 minutes before hitting the beach. 5. Beware of submerged dangers. Sharp rocks, shells, coral, and jellyfish can injure your dog. And, because dogs often don’t indicate when they’re in pain, you’ll need to watch his body language and carefully check him for cuts and scrapes. 6. Watch out for predators. Many birds, like hawks and eagles, do their hunting near water. If you have a small dog, be vigilant so he doesn’t become a target. 7. Calm water is best. Surf boards, jet skis, and big waves can frighten your dog. Find a quiet place to play with your pup, or locate a local dog beach were surfing and boating are not allowed. 8. Head for cover. The sun and sand are fun, but it’s nice to have a place to take a break in the shade and out of the wind. Consider bringing an inexpensive tent to give you and your dog a comfortable place to relax. 9. Don’t overdo it. Running on sand is strenuous, so don’t expect your dog to be able to fetch as long as he might at the dog park. And start slow, giving him time to warm up to avoid a muscle pull. 10. Cold water can hurt. Remember, if your dog has arthritis or other joint issues, swimming in cold water can irritate the condition. Stick to shallow water and bays where the water is warmer. 11. Rinse thoroughly. When you’re done playing, take time to rinse salt, sand, and microscopic organisms from your dog’s coat. Also, be sure to dry your dog’s ears as moisture in the ear canal can cause ear infections. Do you have any additional tips for dogs going to the beach? All good advice. Here on the oregon coast we get a lot of wind. Sand blows mostly below two feet above the surface and dogs eyes can be injured by all that sand. We warn tourists constantly because they don’t seem to recognize the danger. Great point about the blowing sand. We definitely noticed it – but it bother Ty more because he’s shorter than me. Just a friendly FYI…my 3 Corgis LOVE to swim. Yes, I have life jackets for them so their short legs don’t get so tired but they are great swimmers! That’s so cool, Gretchen … you have super-Corgis! 1. 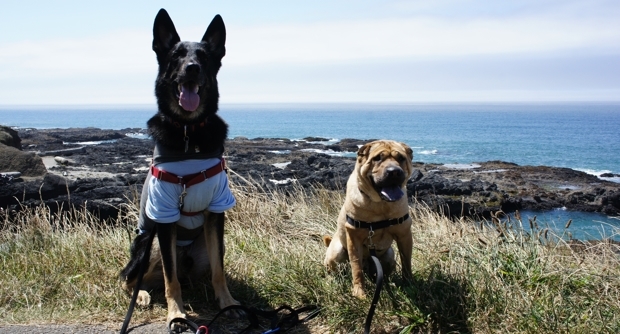 It’s much safer to keep your dog leashed in any unfenced area, and this includes the beach. No matter how well-trained a dog may be, he’s still an animal, and a properly-fitted leash offers the best protection from having him stray, which could lead to accidents, injuries, or getting lost. At the beach, using a harness with long leash (they come in VERY long lengths, check pet supply stores and pet/horse catalogs like Jeffers for excellent prices!) is safest, especially when swimming. The leash will allow the dog to be located at all times, and the harness will allow you to pull the dog in safely if a rip current or strong wave washes him out further than you can swim. 2. Drinking sea water is actually more than a bad idea – it can be fatal. Salt water is not intended to be ingested, and can easily throw off the body’s delicate balance of electrolytes in the blood. Don’t panic if he takes a quick sip, but discourage it, and supervise carefully to prevent future attempts. Also, provide plenty of water when he gets home, making sure that he drinks it, to prevent dehydration…just in case he did sneak a few drinks. This is one reason why I don’t advocate bringing more than one or two dogs in the water at a time, because many dogs will try to sneak sips here and there. 3. Lakes and other bodies of water can be safer in terms of waves, temps and lack of high salinity. However, you need to make sure that you’re visiting a body of water that’s safe for human swimmers…If it isn’t, it’s not safe for your dog. Algae, chemical or storm water pollution, and parasites can infest lakes and ponds, so always make sure to check into this first. You can phone the town’s Health Department at the local Town Hall for more information. 4. It’s generally safer (and easier for everyone!) to walk down near the water on a beach, where the sand is packed harder, than up further on beach where the sand is deeper, and people are sitting. Not only is it easier on the joints, but also, you can avoid hidden sharp items in the sand, edibles that may have been dropped around people’s chairs earlier, etc. 5. Remember that mosquitoes are still out in the fall, and some can carry dangerous diseases, such as EEE, West Nile Virus, or heartworm. Ticks can be plentiful near beaches of all kinds as well. Make sure your dog is kept current on Heartworm preventative meds (like Heartgard or Interceptor) and a safe, topical flea/tick/mosquito-repelling med (like Advantix) applied at least 24 hours prior to going for a swim.